Agribank’s new CEO, Sakaria Nghikembua this week announced the bank is still in the process of reviewing the so-called Emerging Retail Financing to mitigate emergent risks and to fine-tune its approach to farmers. “In response to market demand for collateral-free products, the Agricultural Bank of Namibia undertook to introduce a new product called the Emerging Retail Financing Product in late 2015. Agribank invited applications from interested emerging farmers, who demonstrated significant interest in the product. Subsequent to this process, new developments necessitated a comprehensive review of the product and the timing of its launch. In light of this delay, Agribank wishes to inform applicants and potential clients that the review process remains underway” Nghikembua stated. 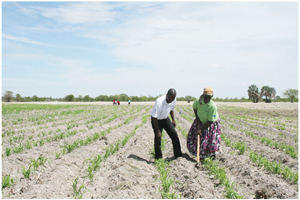 Agribank said it remains committed to finding innovative solutions to ensure the financing of emerging communal farmers who do not have the traditional fixed-property collateral, in furtherance of the bank’s stated intent to transform the agricultural sector, improve productivity in agriculture and contribute to food self-sufficiency.